Amazing plans to transform abandoned clay pits in Coalisland into a state-of-the-art racing track is already a winner for Mid Ulster businesses. The man behind the plan, David Henderson, has not only brought Dungannon Estate Agents Niall Maneely & Co on board, but has also used a Toome based architect and engineer to help draw up designs for the circuit. 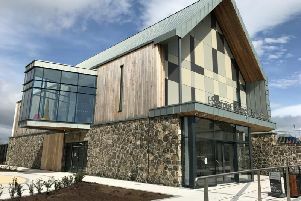 Graham6 Architecture and Engineering posted on their Facebook page yesterday (Tuesday, Sept 6) about just how “proud and excited” they were to “finally announce” they had submitted phase one of the Lake Torrent Centre of Excellence “for full planning”. And Mid Ulster Council has confirmed that they have indeed received the application. Graham6 went on to say they were hired by Manna Developments as racing development consultants on the scheme, which means they were involved with the creation and deign of the racing circuit and its infrastructure, liaising with international circuit designers, the FIA and FIM international governing bodies. And they hope to help make David Henderson’s dream a reality. Phase one of the Lake Torrent scheme is said to include an international tarmac racing circuit that stretches 4km. “We feel this circuit has the potential to be amongst the global favourites, incorporating a tunnel section, corkscrew, heavily banked bends and a mix of fast, flowing and slower technical aspects,” the firm said. “We have worked tirelessly to draw the best possible design from the site, designing to maintain the aggressive elevation changes and incorporating the stunning features which currently exist. “We have also submitted the design of a bypass/link road for the town of Coalisland, with the intention of easing everyday congestion of traffic within the town, reducing air and noise pollution. In addition, a crèche, restaurant, multi-faith mission hall, a community building to incorporate the local boxing and other community led clubs and community gym have been proposed for phase one.